Over the last 20 years we’ve made huge progress in making our beaches and bathing waters cleaner. In 1988 only 18% of our bathing waters met minimum standards, in 2016 this was 100%. The 2014 bathing water season runs from May to September when staff from the Environment Agency test the levels of bacteria in 20 samples taken from the water. The results of the tests are posted on our map for each bathing water. As well as the sampling, there is also a system in place to advise the public against swimming and paddling after heavy rain. Rain washes pollution into rivers, lakes and seas, causing short term pollution, which may last for up to 72 hours. Look out for an advice sign when visiting the beach after it’s rained. The short term pollution (STP) scheme could help a number of North West bathing waters to meet the EU revised Bathing Water Directive. If a sign is displayed when the Environment Agency comes to test the water, and if certain other conditions are also satisfied, the results of that week’s test could be discounted from the overall score for the year. This ensures that at beaches where water quality is normally good, the long term classifications will reflect this, tourism is supported and the local economy is protected. But most importantly, it makes sure that when bathing water is likely to have temporarily deteriorated, people are informed of the short term risks of swimming there. SEA LIFE Blackpool supports the LOVEmyBEACH campaign through regular beach cleans, letting staff and visitors know how they can help at home and when visiting the area. The LOVEmyBEACH campaign is a great way for anyone who lives, works or visits the North West to make a difference and help improve the North West’s bathing waters. And if you spot pollution, please call the Environment Agency incident line on 0800 80 70 60. 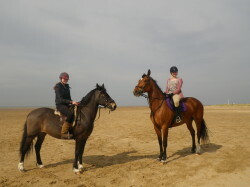 If you’re a horse owner and love riding on the beaches in the North West, please follow the code of conduct on your favourite beach and like Joss and her friends, only ride where horses are permitted. Sefton’s coast is a haven for wildlife and riders are asked not to take their horses into the dunes or through or near flocks of wading birds on the foreshore. North West student Sian Leake has been knee deep in her studies, examining the effects of rainfall on bathing water quality. Sian, who’s 22 and from Chester, teamed up with the Environment Agency to write her dissertation on the relationship between low water quality, heavy rain and high tides over the last 10 years. The dissertation was for Sian’s degree, a BSc in Environmental Sciences at Leeds University. Thousands of words and lots of hard work later, she was able to prove the relationship between high levels of rainfall and poorer bathing water quality at four of our North West beaches, Fleetwood, Cleveleys, Blackpool South and St Annes North. During periods of heavy rain, pollution can be washed off farmland and salt marshes, ending up in rivers and eventually our seas. It normally takes around 72 hours for a bathing water to recover from short term pollution. This summer, beaches across the North West will put up signs advising people when short term pollution is likely to affect water quality. As well as learning about water quality, she also got a chance to work with Turning tides partner, the Environment Agency to find out about the work that’s being done. Sian is yet to receive her final mark for the paper, but we wish her all the best!